Skulls. Revolvers. Esoterica. Only at The Hunt. My sir, this is a fact: you’re going to leave this world someday. And what you leave behind is going to tell your story. A man who shops at The Hunt, now online. The new online store is divided into four categories: attire, collectibles, decor and “man & beast.” Which makes for some interesting shopping. There’s a beautiful, old-school world globe. Antique iron sheep shears. A vintage desk lamp. Hand-engraved WWI naval binoculars. Fencing masks. 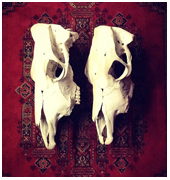 And animal skulls. Lots of animal skulls. Go to the site and look around. Even if you’re not looking for, say, a model of a human rotoscoliosis or a ram skull, there are some real purty images to peruse, including some B&W photography and videos with a true Americana vibe. No words, no dialogue. Just some nice, non-skull aesthetics.